The colors you surround yourself with can affect your state of mind. Excitable red, calming blue, optimistic yellow, regal purple—it’s true. The colors in your life have an impact on mood—even to the point that they can stimulate or depress your appetite. Nowhere is color’s impact more apparent than in your home, where the paint on your walls can quite literally bring you such emotions as comfort, cheeriness, serenity and wellbeing. The colors you select for wallpaper, flooring, draperies, bedspreads, cabinets, countertops and molding have similar potential to shift your mood. Here are some interesting tidbits about how the colors you use in your home can improve your state of mind. Several colors are associated with peace and serenity, thereby offering a welcome retreat from the stimuli of the outside world. Blue is among the most soothing of colors. Think of the gentle waves of the ocean, the sky on a cloudless summer day, or the eyes of a newborn baby. The emotions that blue evokes makes it the perfect color for a bedroom, a master bathroom or a quiet nook for reading and meditating. And if you have a beach house, a blue motif works well throughout the home as a compatible décor for your surroundings. Another color that lifts your mood is green. Just think about days spent in your garden or walking through a local park. The greenery of the grass, trees and foliage helps you feel more refreshed and can actually alleviate stress. Using green in your decorating—whether paint on the walls, an area rug on the floor or plants near your windows—is a great way to feel better about life. Other colors that offer soothing qualities are neutrals such as gray, beige, taupe and off-whites as well as pastels such as light pink, soft yellow, mint green and a whispery lavender. Warm wood tones also offer a sense of coziness and serenity. Are you looking for a color that reduces negative emotions? One color that has been scientifically proven to do so is pink. In fact, color researchers in the 1970s conducted an experiment using pink to calm angry and antagonistic behavior among prison inmates. They painted the walls pink, which produced a calming effect (though the effect did lessen once the inmates got used to the color). In small doses, pink can be a wonderful color in many areas of the home—not just for baby girl nurseries but for older girl bedrooms, powder rooms and guest bedrooms. If you want to tone down the pink, you can pair it up with other colors like gray, teal, bright red or orange. Ever wonder why fast-food restaurants use so much orange and red in their signage and décor? Why, to stimulate your appetite, of course. Those marketing experts don’t miss a trick! Color researchers have known for years that reddish hues are more conducive to a healthy appetite. Conversely, blue is an appetite buzzkill. Good thing to know if you’re dieting! But it’s also good to know when considering colors for your kitchen or dining room. If you want your casserole surprise to delight the taste buds of family and friends, any other color but blue is the way to go. Color psychology isn’t only about hue but also about lightness and darkness. Light colors can make a small room feel more spacious, whereas dark colors can make a cavernous room seem smaller and cozier. Your eye plays a helpful trick to change your perception of the space, but the colors also evoke a certain psychological feeling that can change your mood when entering a space where the size might otherwise be confining or intimidating. Being calm, peaceful and serene is all well and good, but sometimes you need a little excitement in your life. Red is a color that experts associate with energy, excitement and passion. Orange is similarly a color that pumps up the energy in a room. For your home, you might want to use these colors in small doses for accents, accessories or focal walls. Or you may wish to get bold by using the colors in an area where a lot of energetic activity is taking place, such as a rec room or a man cave. A word of caution, however: It’s best to avoid the most intense of these colors if you’re prone to stress, since colors like red have been clinically proven to increase adrenaline. Going monochromatic doesn’t mean your room will lack variety or flair. Color is one of the most effective ways to express yourself and your personality, so why would you want to go with a monochromatic decorating scheme? Wouldn’t that be safe, drab and—the worst sin of all—boring? Actually, going monochromatic doesn’t mean your room will lack variety or flair. Done right, a monochromatic décor can be sophisticated, soothing, and quite distinctive. Monochromatic color schemes allow you to achieve an interior décor that is cohesive and easy on the eyes. 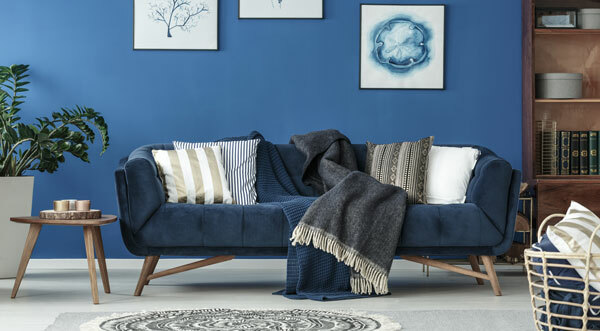 A major advantage of this type of palette is that you’re less likely to make mistakes: no worries about whether your complementary or split-complementary color plan is too jarring to the eye. If you have an open floor plan, staying within the parameters of a monochromatic color scheme can give you a nice flow from space to space. The most successful monochromatic schemes typically involve the use of a neutral color that’s rendered in various different values—that is, a range of lightness and darkness. But keep in mind that color is only one aspect of your decorating scheme. Texture, sheen, and pattern also are effective ways to add visual interest and sophistication to a room, and they can be particularly effective in a monochromatic color scheme. If you’ve built your room around a taupe scheme, for instance, pattern can help you use the color in unique and eye-catching ways. A paisley print on your throw pillows, featuring closely aligned colors, will add a nice decorative flourish to your sofa. A floral or geometric pattern on an area rug, rendered in a moderate shift from your chosen color, is a beautiful way to pull your color scheme together. Use a pattern on the wall to add interest within your chosen color scheme. Wallpaper will allow you to introduce pattern, texture, or contrasting sheens to a single feature wall or even to the entire room. Similarly, you can create a painted wall treatment that adds pizzazz to your monochrome scheme. For example, a tone-on-tone striped effect with subtle shifts in color and sheen can add just the touch of sophistication you’re looking for. Texture is another important element of a monochromatic color scheme. You can use texture in various elements of the room—for instance, a plush area rug, a woven window treatment, multidimensional wall tiles, a faux-brick wall finish, or carefully chosen accessories (more on those below). Accessories are a great way to make your monochromatic décor more distinctive. A glass and chrome accent table, a tall floor vase in a unique material such as galvanized metal or concrete, a piece of rough-hewn pottery, or multimedia wall art will add an element of texture. In a monochromatic color scheme, your accessories are a way to add some color—for instance, with some greenery or blooms in your vases or a multicolored art piece hanging above the fireplace. Finally, light is a way to make your monochromatic décor quite literally shine. Distinctive light fixtures and lamps add a nice element to the room, and you can use track lighting to highlight a specific area or decorative element. Natural lighting is another great element to feature in a monochromatic room. Make sure your window treatments can be easily lifted or drawn to the side to add a light and airy feeling to the surroundings. A few trade-offs can result in a design that makes everyone happy. You say, “Wallpaper.” I say, “Wall texture.” You say, “Carpet.” I say, “Hardwood.” Before you call the whole thing off, recognize that compromise might be required to resolve disputes over home décor. Whether you’ve just purchased your first home or are finally getting around to redecorating after decades, you may find that those diverse views that make life interesting in the best of times add heat to discussions over design decisions. Keep in mind that differences over decorating are common, and a few tradeoffs can result in a striking décor that makes everyone happy. When two people share a dwelling, what makes it their home is a concerted effort to reflect the combination of styles and interests. If a major disagreement arises over interior design, a first step may be to look for common, or at least complementary, ground. Start with the palette: A visit to Tommy's Paint Pot will offer a wealth of color schemes and wall-finishing options from which to choose to form the backdrop of your décor. Next, compare furnishing styles. If your tastes run to classical and your partner prefers modern, you may be able to find some elements of each style that offer a starting point for discussion. Spend some time browsing decorating sites, shows, and magazines to identify rooms that you like. You’ll also have plenty of opportunities to talk about why you like this and why your partner likes that, which may provide some insights into the emotional aspects of decorating preferences. Shopping and making these decisions as a team makes it more likely that both of you will feel involved and pleased with the outcomes. Speaking of shopping, that’s another area where there may be some disagreement. You may love to shop—the more choices, the better—whereas your partner hates it, or vice versa. In that case, one solution is for the shopping pro to make some scouting trips, return with paint and wallpaper samples and fabric swatches, and then schedule return visits to the stores most likely to yield maximum results with a minimum time commitment from the non-shopper. Combining your decorating preferences and treasures can yield a décor that’s fabulous and uniquely yours. Style, function, and comfort aren’t mutually exclusive. An antique cupboard can command a place of honor in otherwise modern surroundings. Going room by room is another strategy. If one of your style preferences dominates in the living room, the other person could make key design decisions in the kitchen. And each of you can have your own spaces on which to place your stamp by choosing favorite colors, furniture, and belongings to showcase in a den, sewing room, or hobby haven. Some rooms can be designed for double duty: The basement man cave may occasionally be rearranged to make room for a big family get-together. The home office can double as a display for that prized collection that used to grace a living room. People have strong attachments to their belongings and sense of style. It may be hard to agree that a cherished collection of salt and pepper shakers or sports memorabilia would clash with a new living room décor. Acknowledging the pangs that arise over such decisions and appreciating each other’s willingness to compromise are crucial steps in creating surroundings you can both call your own. Quarters is published by the Paint & Decorating Retailers Association (PDRA) and brought to you locally by Tommy's Paint Pot. Be sure to check out page 27, Colors & Moods which includes expert advice from our own Marcy Beard. Printed copies are available in our stores while quantities last, or you can peruse the magazine within your web browser below. You’ve discovered the perfect apartment—or at least as close to your ideal as you’re likely to find. Now it’s time to make it your own with equal dashes of functionality and flair. Even in a small apartment, you can go big on style. Short of knocking out a wall or replacing the kitchen cabinets, you have plenty of options to add personal touches. 1. Make a statement with color. Set the tone with a palette that unites and accentuates. One idea is to start with a prized possession—a comfy chair or gorgeous table lamp—and build your color scheme around it. For a smaller space, a couple of light-and-bright shades with a darker accent color may work best. Painting the walls might not be an option, but you can paint your furniture to bring the décor together—or in a range across your chosen palette to delineate distinct areas in an open-concept layout. Removable wallpaper, murals, and decals can also add dramatic statements. New peel-and-stick products are easy to apply (and remove), and they range from realistic brick and barnwood finishes to eye-catching geometric patterns and whimsical prints. 2. Define your living space. If most of your apartment is one big room, then you can simultaneously embrace the open space and stake out entry, dining, living and sleeping spaces with strategic placement of furnishings. To create a welcoming entryway, position a hall tree or a tall shelving unit refashioned for functionality: Replace the upper shelves with coat hooks around a mirror and place square baskets in the lower shelves to store hats, sunglasses, and shopping bags. A cupboard or buffet can help define the dining area, extend kitchen storage, and provide a serving surface. A swag light over the dining table will set this space apart from the living area with its own distinctive lamps. Area rugs can also designate zones, complement color themes and (bonus!) hide worn carpet or floorboards. In a studio apartment, position your couch or a couple high-backed chairs with their backs to the foot of the bed to delineate the sleep space. 3. Add smart storage. Shelving choices abound to reduce clutter and set off your décor, from tall industrial-style metal units to wooden bookshelves to floating shelves on the walls to display framed art, photos, and small knickknacks. Look for coffee tables with storage shelves or drawers. Stick a wicker hamper or stackable wood boxes in a bare corner to store linens. Let no space go wasted. 4. Dress up the windows. Make the light through your windows a focal point of your living space with colorful curtains or a curvy valance to cover bland miniblinds when they’re not in use. With a simple rod and curtain hook rings, you can hang any type of fabric. Base plant choices on the available light to create an indoor garden, and position your table or desk accordingly if you’ve got a room with a view. 5. Nurture your inner neatnik. The smaller the space, the more quickly messes can pile up. To live comfortably in a small space—and show off the style you’ve worked so hard to achieve—develop the habit of putting things back where they belong and decluttering regularly. You may not be able to call your apartment spacious, but with a little planning and ongoing maintenance, you can declare it just right. 1. Protect your floor with a dropcloth. 2. Perforate the wallpaper with a scoring tool. These tools are designed to not damage the wall, but don’t press too hard—just enough to perforate the wallpaper. 3. Apply the remover to the surface in accordance with the label instructions. Wait the specified time (usually about 15 minutes) to allow the paste to loosen. 4. Use a wallpaper scraper to remove the wallpaper. 6. Clean the wall thoroughly, using a sponge. These color combos have staying power for several reasons. They tend to be complementary on the color wheel and are soothing to the eye. They’re also naturally comfortable together; most are found in nature. Many classic color combinations are also linked to iconic images in culture. Blue and yellow? Vintage china patterns. Green and pink? English gardens. Purples and browns? Autumn flora and fauna. Red, black, and white? The American diner.